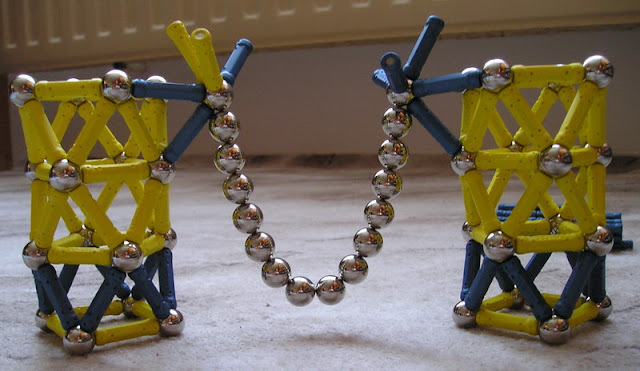 Using no more than 96 rods construct a free standing, self supporting structure designed to hold the maximum number of joined spheres between no more than two anchor points. See picture for crude example, wherein 4 joined spheres are suspended between 2 anchor points. What's the maximum you can achieve? OK, my bad. I got my sums wrong, you are allowed up to 144 rods to achieve your goal. My best score? 15 joined spheres. Well, you've had a week and still no takers? I want to give it a try but I have been busy and did not find the time. Don't wait with the 'solution' just because of me, I'm fine with participating later. I've been able to suspend 12 quite convincingly, but now stuff is starting to explode! must not touch anything except sphere at the endpoints? Using a Supermag structure I had laying around on my desk (for a suspended ball), I figured I could modify it and try this challenge. Right now I'm looking at 12 suspended balls and am probably pushing this construction's limits. I'll have to try it with Geomag and see what I can do. I haven't really had much time to experiment lately. The example does show a degree of cradling, however in my solution (which I promise to build soon and share with you) the chain of spheres hang from the two endpoints and touch nothing else. I've never had a go with Supermag so I'm not aware of its limitations. I'm happy that people are trying this challenge, it shows that interesting problems can be explored with only a small amount of Geomag! A lot of the amazing constructions shown in these forums are simply beyond me as I don't have enough stuff to get even close. A bit jumpy is right... I'm at 15 right now. May play with it a bit more after lunch... And I'll try to remember to bring a camera in on Monday for a picture. My best result is 14 balls. Nice work Tychi, your design is much simpler than mine! However there appears to be contact between the spheres closest to the anchors and the blue rods holding the anchors at the bottom - not allowed I'm afraid. Should be fairly easy to fix and I also think that with a delicate touch you may get the 15th sphere in place.